In the September 2009 issue of Sanitary Maintenance, the article "Throwing In the (Paper) Towel" mentioned the advantages of hand dryers, when compared with paper, from environmental and economic perspectives. However, these perspectives do not consider the primary function of hand drying, which is hand hygiene. Hand hygiene is considered to be the most effective measure to prevent microbial pathogen cross-contamination and health care-associated infections. Why is hand drying so important? Because it complements the other side of hand hygiene — hand washing — by ensuring that touch-contact-associated cross-contamination is reduced to a minimum. Residual moisture left on not properly washed and dried hands is the single most determinant factor for hand hygiene. For instance, about 60,400 bacteria are being transferred to the skin of a person being touched with damp hands. Although, there have been contradictions in literature, the majority of the studies conducted under realistic conditions showed that the use of paper towel is the best drying method to minimize the spreading of bacteria, compared to warm and jet air dryers. Bacteria are transferred from wet hands to the paper towel, which reduces the number of remaining bacteria on our hands. 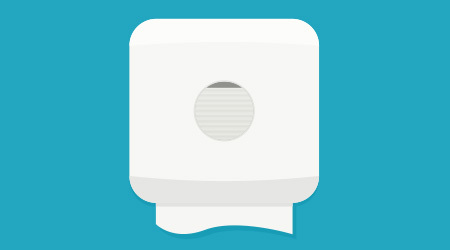 Some studies reported there are no significant differences between paper towel and warm air dryers. Interestingly, only one study showed that warm air dryer is better than paper hand towels. Warm and jet air dryers have the potential for depositing pathogenic bacteria onto the hands and body as well as projecting them into the surrounding environment. In 2007, an extensive review of hand dryers design reported that the average air temperature and cycle time were insufficient to kill bacteria. Additionally, people's hand hygiene practices in public washrooms must be considered. A survey of hand hygiene practices, conducted on a residential college campus indicates that 33 percent do not dry their hands after washing. When people are in a hurry, they rarely use warm air dryers long enough to ensure sufficient dryness and often complete the process by wiping their hands on clothing! To prevent the transmission of illnesses in health care facilities, the World Health Organization (WHO) and Centers for Disease Control and Prevention (CDC) recommend that hands be thoroughly dried using a single use towel. In summary, from the hand hygiene perspective (primary function), the use of paper hand towels is an excellent drying method to minimize the propagation of pathogenic microorganisms, and a majority of studies show that a paper towel is a more reliable method to meet this primary function.